The 2018 FIFA World Cup has now come to an end with France as the last team standing. The world’s biggest football event saw plenty of sweat and tears, as well as exciting and emotionally-charged moments that relied heavily on precise timing. This accuracy was crucial from the first kick-off to the last and Hublot were there every step of the way to ensure it. For the third time, Hublot were the Official Timekeeper for the World Cup and the horology giant took this opportunity to make quite the impression at this event. They had already made history in 2014 for the FIFA World Cup in Brazil, when they became the first and only luxury watch brand to redesign the referee boards, transforming them into the shape of the Big Bang watch. And this year was no different; every time there was a substitution or additional minutes added to the clock, Hublot’s name and branding shone. Hublot and football go hand-in-hand, and the Swiss watchmaker was as much of a winner of this World Cup as France and its fans. After 64 matches, 169 goals and 49,651 passes, this World Cup was, undeniably, a whirlwind of emotions, filled with jaw-dropping moments and joyous surprises for its many supporters. One of the biggest moments of the event has to be, of course, when France was crowned champion at the final. The French team and staff celebrated happily while throwing Didier Deschamps in the air; the manager is only the third man to win the World Cup as both a player and a coach. The first two were Brazil’s Mario Zagallo and Germany’s Franz Beckenbauer. It’s impossible not to mention that the 2018 World Cup had an all-European semi-final and final, which hasn’t occurred many times before. In fact, this is only the fifth time, the last one being in 2006 (with Germany, Italy, Portugal and France). Some of the teams that were expected to advance were gone early on, like Germany and Argentina, and teams like Italy weren’t even there to begin with; perhaps this helped younger teams like Belgium to proceed further. There were also fewer yellow and red cards at this World Cup (219 and 4, respectively) compared to previous years; in 2012, for instance, there were 261 yellow cards and 17 red cards. Senegal finished the group stage with the same points as Japan but picked up two more yellow cards; in a costly example of Fair Play rules, the Senegalese team had to leave its second World Cup. This exemplifies just how important sportsmanship, integrity and unity are to FIFA. Hublot champion tradition, team spirit, authenticity and performance, similar values that highlight how much of a match they are with FIFA and how perfect their partnership is. VAR, or Video Assistant Referee, was also a highlight of the 2018 World Cup and dominated discussions around the world. This was football’s first use of video technology and it allowed referees to reach more correct decisions by reviewing certain plays when needed. This system helped to overturn 17 of 20 wrong decisions this year, so it’s clear that technology such as VAR is shaping the world of football and its future. Of course, VAR wasn’t the only technological marvel in the 2018 World Cup. 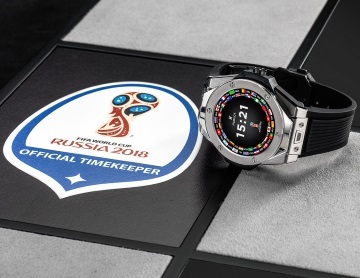 While other smartwatches made an appearance at the World Cup, the timepiece of the event was, undoubtedly, the Hublot Big Bang Referee 2018 FIFA World Cup RussiaTM. Reinvented for the occasion and worn by referees and managers alike, the Big Bang was heavily featured throughout the World Cup; and, with 32 different dial designs and many strap options, users could personalise them as they saw fit. For managers, this meant they could customise the watch with their team’s colours. Not surprisingly, many team leaders were spotted wearing this advanced smartwatch as they paced up and down by the pitch or congratulated their players on a game well played. Didier Deschamps, Gareth Southgate (England’s coach), Roberto Martinez (the Belgian coach), and Stanislav Cherchesov (Russia’s manager) were just some of the coaches seen with a Big Bang watch on their wrists. The wristwatch worn by referees was slightly different, as it had an additional purpose: to connect them to state-of-the-art goal-line technology. This limited-edition watch also helped fans around the world to stay connected to every decisive moment of the World Cup as well. It notified them of each game 15 minutes before kick-off, sent them live updates of the action (including statistics), and vibrated with a large GOAL notification every time a team scored. This smartwatch wasn’t the only Hublot timepiece to make an appearance at the World Cup. Maradona was seen wearing not just one, but two 45mm Hublot Big Bang Unico in King Gold as he watched the games, while the Australian international Tim Cahill, sported a 45mm Big Bang Unico White Ceramic. The manager of the Spanish team, ex-Real Madrid player Fernando Hierro, was also wearing a Big Bang Unico with ceramic bezel as he helped to steer his team to the round of 16. And several managers and footballers were spotted with watches from other popular Hublot ranges, such as the Classic Fusion. Hervé Renard, the French-born defender who is now the manager of the Moroccan national team, was seen on the pitch with a Hublot Classic Fusion Aerofusion Titanium watch (image). Xherdan Shaqiri, the Swiss footballer who enjoyed his third World Cup, arrived in style in Russia with a Hublot Classic Fusion Ultra-Thin Skeleton in King Gold. Only 300 Big Bang Referee 2018 FIFA World Cup RussiaTM watches were released in the UK and, due to their popularity, quickly sold out. 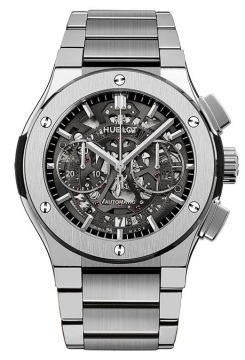 However, you can still explore the other Hublot watches we stock at Banks Lyon and view the full Big Bang and Classic Fusion ranges – you can soon be wearing the same timepiece as your favourite footballer or manager. We stock superb collections that are the epitome of the ‘Art of Fusion’, perfect for football fans or simply for the modern man who is passionate about style, technology and accurate timekeeping. Contact us to learn more about our wide range of watches and jewellery or find us in Lancaster (01524 38 10 20) and Kendal (01539 73 03 00) to see them for yourself. Follow us on Facebook, Twitter and Instagram to stay on top of our latest news and arrivals.